We are thankful to our wonderful team of volunteers. 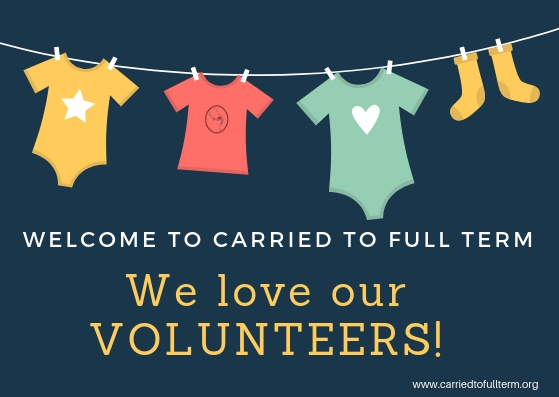 We rely on the transforming power of each of our volunteers in order to meet the mission of transforming and saving lives here at Carried To Full Term. If you would like to join our team of volunteers we have listed a few of the areas in which we can use your support. Provide transportation to appointments, church, etc. Teach a class: Vision Board, Bible Study, Parenting, Financial Management, Cooking, fitness, etc. —parenting techniques, financial responsibility, self-dignity, cooking, knitting, etc. To sign up to become a volunteer click here or on the image below to complete an application.